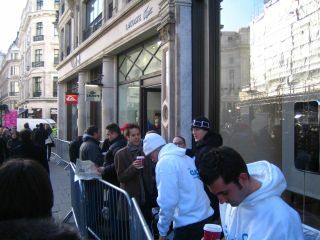 As the queues grow longer, are people really going to find a much better product? With just two days to go until the 3G iPhone hits the shops, the advance reviews (of a sort) have just appeared, with an emphasis on assessing how that new wireless chip affects its longevity. However, according to Gizmodo's handy roundup, the most worrying aspect of the new handset is not the expected battery hit, but the fact that many of the problems with the first iPhone haven't been fixed. Of course, we knew all this anyway, but seeing it in the flesh rams home how Apple still sees fit to leave out a memory card slot, the ability to change the battery yourself, video shooting, MMS messaging and even simple text copy and paste. As for that battery, nothing's really clear from such a small sample as the three reviews quoted, but it does look as if Apple's five-hour talk time is about right. Come Friday, naturally, we'll all be able to judge for ourselves, but one thing is for sure. Just as the iPod did wonders for businesses selling accessories, the iPhone will be a boon to third-party software providers – they can't do much about the hardware issues, though.